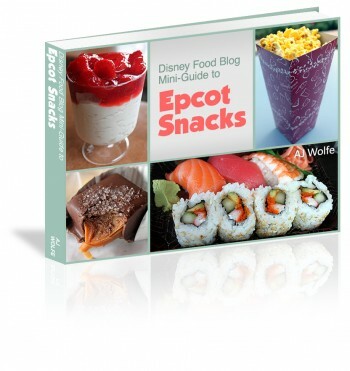 The Disney Food Blog has announced the release of The DFB Guide to Epcot Snacks e-book, 2014 edition! The DFB Guide to Epcot Snacks e-book features more than 290 pages of information, advice, and photos to help you get the most out of your snacking experience at Epcot. The e-book also includes photos of more than 250 snacks at Epcot, current pricing and Disney Dining Plan snack credit status for the snack items, insider tips, snack reviews, and more. The DFB Gude to Epcot Snacks is an instantly downloadable PDF that can be saved on your computer, smarthphone, and tablet giving you access to the guide while touring Epcot. For more details check out The DFB Guide to Epcot Snacks. This entry was posted on Friday, June 27th, 2014 at 12:00 pm	and is filed under Dining, How To, Planning, Theme Parks. You can follow any responses to this entry through the RSS 2.0 feed. You can leave a response, or trackback from your own site.